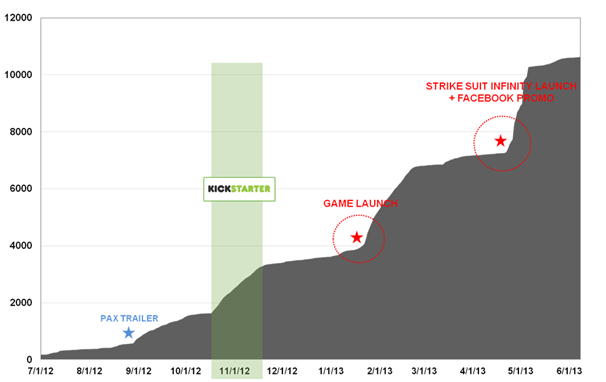 I have promised to write a post-mortem on the Strike Suit Zero Kickstarter for a while now. I haven’t done so for many reasons, but the main one was that I wanted to have the game out and most of the rewards delivered before doing so. The fact that the game has been released is one of the most interesting points here, and a good way to get a complete view of what the Kickstarter did for the game beyond the campaign. For lots of reasons outside of my control as well as the studio’s, I won’t be able to share sales number for the game. It is unfortunate but hopefully, there will be enough to learn from here to still make it valuable. As a short side note, I probably need to clarify my role with the studio: I am a Non-Exec Director of Born Ready Games and worked as an executive producer for the title (not hands on, providing on-going feedback on the project). ICO has been providing the PR for the game in Europe since it was first announced (back in 2011). Back in September last year, the studio realised that while the game development was progressing fast, it wouldn’t be possible to finish it in the timeframe allowed by its cash in the bank. After discussing different options, we decided to take the issue to the existing community (while it was small, it was there and had been built for the past 3-4 months) and see if crowdfunding could help fill in the cash gap needed to finish the game and add some polish. The campaign was launched on the 18th of October with a $100,000 objective. It was successfully funded on the 17th of November, with a total amount pledged of $174,804 from 4,484 backers. The game itself was released on the 23rd of January 2013. – The Mod tool (as a $130,000 Stretch goal). Available on Steam since the 20th of May. – The Oculus-support beta (as an optional add-on for a symbolical $1). It has started last week for some of the Kickstarter backers. – The Mac and Linux support. The stretch goal wasn’t met (barely, it was at $180,000 and the PayPal pledges didn’t add enough to meet it) – so the studio decided to support it but not as a simultaneous launch, as promised in the stretch goal. Mac beta has just started last week. Overall, the studio has nearly completed the project it was raising money for and it will be all done before the end of the summer. 1 – Good planning. Ahead of the campaign, we took a lot of time to research other similar projects (scope and theme) and it helped a lot to create the campaign as well as during the campaign itself. Obviously, it wasn’t perfect as the next chapter proves, but it would have been way worse without all the prep. 2 – Dedicated resource. Jamin (the studio’s community manager) was on the campaign full time; talking to the backers, working on updates, keeping track of requests and questions. 3 – Involving the team in the campaign. Getting them in the video and the updates was good for morale but also showed the identity of the studio. 4 – Excellent PR impact. 47 (in the US) and ICO (in Europe) were managing the PR for the game at the time and the coverage the game got during the Kick Starter campaign accelerated massively.. I don’t think that back then being on Kickstarter was a story in itself already, but it helped support one of the key message : space dog fighting games were once huge and needed to be more represented). Word-of-mouth supported this a lot obviously, some backers asked some media that had not been covering the title to talk about the game and they did. “Game X goes to Kickstarter” is not a story anymore, but if you do have a story to go with your campaign, it will make it possible for the message to spread more easily. 5 – Joysticks. I mentioned this at events where I am talking about the campaign, but the addition of the Logitech joysticks during the campaign created a mid-campaign push thathelped a lot. Just check the numbers below. I think backers loved the idea of having a joystick again (tapping in the same nostalgia sentiment that exists for the genre) – and the game was perfect to play with a joystick. 6 – Studio financial health. Without the Kickstarter money, I have no doubt that the game would have been released, but in a poor state (it was still a bit rough and some may say it still is, so imagine what would have happened) and it would have been at the cost of redundancies or possible worse. The extra money then was essential not just to get a better game out, but to give the studio enough rope to release it properly. It is now in a much better shape and was able to self-finance the stand-alone score chaser based on Strike Suit Zero for instance (Strike Suit Infinity). 7 – Junji and Paul were ace. Junji Okubo is the mecha designer behind the Strike Suit and the ships design. Paul Ruskay is the composer of the music. They both gave us incredible support. Paul waved some of his rights to the music for the rewards of the Kickstarter campaign. Junji offered to design mechas for the $10,000 rewards (that nobody backed, but were still really awesome). They also both shared the word about the game and the campaign. I don’t think it is a coincidence that the highest average pledges came from Japan for instance ($80 per backers on average, compared to $40 for the rest of the world). 8 – Merch. An unexpected benefit of the campaign was the sudden access to a number of merchandise opportunities. While the studio hasn’t made any plans to sell them for now, having artbooks and OST CDs is a nice thing. Meeting with potential partners, being able to give the artbook and say “this is the art style of that game we made” makes it easier to break the ice. 9 – Team morale. I couldn’t judge from this first hand, but everyone mentioned to me how it boosted the team’s spirits. Going from “working on a game we think is cool” to “working on a game that people think is cool enough to support” does miracles. 1 – Paypal. It went live way too late and was difficult to manage. It was put together in a rush and nobody in the studio had proper experience with it. This was a missed opportunity and had we had it up and running earlier the impact on teh overall campaign could have been much larger. 2 – Lack of some skills within the studio. Nobody in the studio has experience putting websites together. The game’s website was a placeholder (and a bad one) for most of the campaign and when the main one went live, it still wasn’t a good website. The current site is much better, but it was needed most back then, when backers were researching the game beyond its Kickstarter page. It probably didn’t help build up the credibility of the project. 3– Stretch Goals. Because the campaign was to finish the project, not to start it, the studio had very little flexibility on what could be offered as Stretch Goals. When you go to Kickstarter to fill in a gap in your finance to finish the game, you really don’t want to offer to add XYZ that will delay your game again. It limited the capacity for the studio to push for more funds beyond the initial goal. It is still great that the Mod tool could be added as this was a much demanded feature by the community. In retrospect though, maybe more things could have been added, I think we may have been overly cautious there. 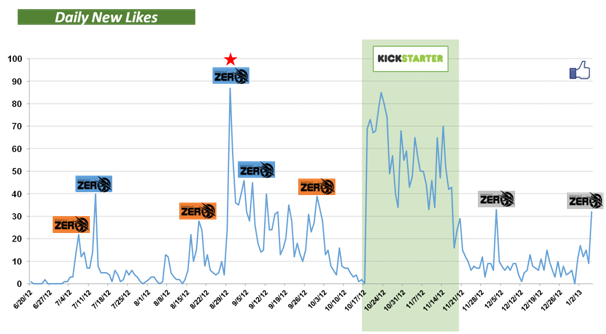 4– Unprepared for the Kickstarter back-end. While this wasn’t the biggest of issues as SSZ wasn’t a multi-million campaign, it was still a massive pain. 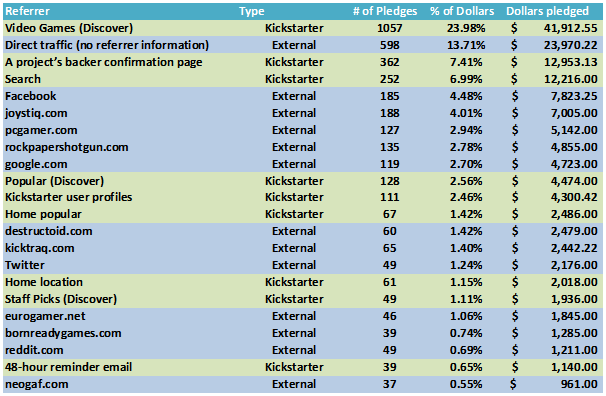 Larger campaigns that have plans to transition backers from Kickstarter to their own backend are really in a better shape to tackle all the requests and micro-management required. The Kickstarter back-end will do so much for you, you need to find your own tools and you usually learn the hard way about the ones that work and the ones that don’t. 5– OST CDs. While I think the rewards were well structured and generally working, I will raise my hand for this one and say “I fucked it up”. We limited the OST CDs to a quite high level ($250), while production of those meant we were going to get a lot more than what the backers would need. Like 950 more than needed out of 1,000 CDs produced. We should have kept the signed CD at that relatively high level and offer un-signed CDs at a lower level. 6– T-shirts and hoodies. While the Insert Coins folks were super supportive, we ended up withtons of delays on the T-shirts. Actually, some have still not been sent as with some sizes, we had quality issues. It mostly comes from inexperience with managing these kind of products – and the delays with them. 7– Pricing. When planning the campaign, we knew the retail price was going to be about $20 and we thought we had prepared that way. We offered the game at $15 for the early bird backers (limited to 1,000) and at $20 as the first price point where you can get the game otherwise, with a few, very anecdotal perks. BUT – when launching on Steam, you usually do a discount, in our case this was 20% off, meaning the game was at $16 at launch… That went way over our heads back when planning (and while we did research what other projects have done, very few had launched and encountered this issue – I now know that others ran into the same problem) and we got criticized by some backers, who were feeling that they were being punished when they had backed the project before anyone and should been treated better. It felt even more painful as they felt the game was almost ready before the campaign and would have launched without their support (they were wrong on this, but that was their perception). There was also strong support from another part of the backer community which answered the criticism better than the studio could have and basically said they were fine with what happened with the pricing as “Kickstarter is about crowdfunding, not about pre-ordering projects on the cheap”. The plan had always been to be generous and to go beyond what had been promised as rewards, and hopefully it has shown, at least in a small way, with the studio offering discount codes for the new content to the backers for instance. The idea was always to keep backers happy – and the studio has this very much in mind. 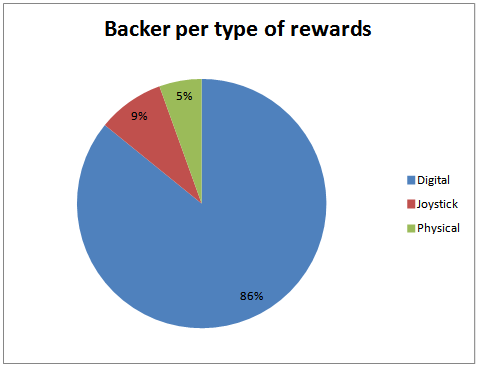 8– Rewards system in Kickstarter. 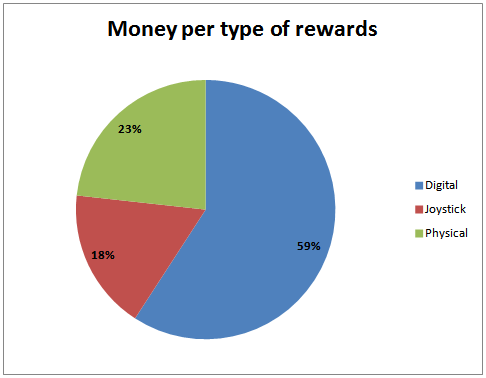 We always knew that we would not be able to edit the rewards after the campaign was launched, and we still made the rookie error of referencing some content as “and all previous rewards”. That meant that when we added the joystick, many backers expected to get this when backing higher level rewards, despite explaining it wasn’t the case at different points on the page. I definitely recommend going with the current best practice to name the rewards and reference them by that name when you need to. 9– Kickstarter documentation. There are quite a few things that you need to learn as you do them on Kickstarter. The way surveys work and advice on how to maximize their use could use some love on the documentation side. Nowhere on the site (it was true back then and it is still true now) are you told that after the campaign YOU CANNOT CHANGE THE MAIN PAGE ANYMORE… When you were able to reflect a lot of things moment to moment on it, losing this ability over night, without notice, is a big issue. It didn’t create many problems with SSZ, but it was very annoying. I did mention this to Kickstarter and I suspect they are working on a way to address this while protecting the information that was historically provided to the backers before the end of the campaign and avoid scamming. Overall, the Kickstarter had a positive net benefit for the project and the studio, no question about that. The failure ratio was incredibly low for the project. No complaints here. The nice folks at Kickstarter said it was generally 2 to 3% of the payment that were affected on average. Pledges for physical rewards making 41% of the money raised is nothing to scoff at. That’s about one comment per 10 backers. The project being a ‘help us finish our project’ rather than “help us start our project”, the engagement with the user was quite different. I would expect more comments and more discussions between backers in a “starting a project” campaign. About 11% of the views watched the video to the end. Not bad, especially as those numbers are current numbers, many months after the campaign is over I suspect views have accumulated during the period after the campaign. 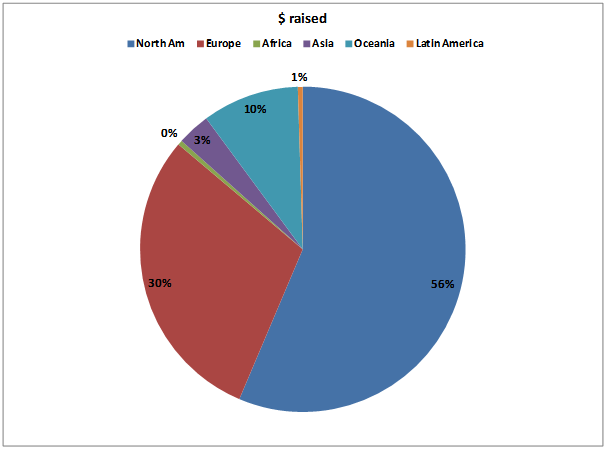 Kickstarter backers were overwhelmingly from Anglo-Saxon countries: USA, Canada, United Kingdom and Australia represent 73% of the backers and 76% of the money raised. Because the joysticks were managed differently through Logitech, the postage costs doesn’t include them. 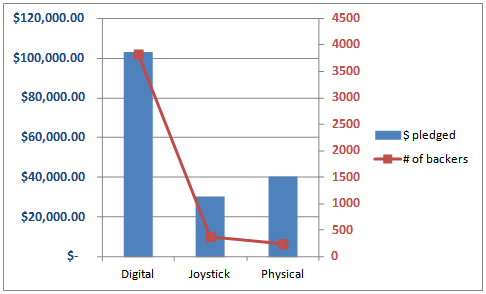 For reference, the studio sent 385 joysticks around the world – and it cost £3,981/$6,221 all included. There are still a few things to send (T-shirts mostly) and the final costs for the 3D-printed figures (and their postage) won’t be final until it is actually done, but at the moment, the studio has spent £17,062/$26,641 for the physical rewards. That’s 15.2% of the total raised spent there. Compared to other campaigns, this seems reasonable and within what was expected. The orange marks are for consumer events (Rezzed, gamescom and Eurogamer Expo), the blue marks are the release of videos (developer diary, Pax Trailer, and a feature on Athene’s channel) and the grey marks are positive articles in some media. Of everything that was undertaken in terms of communication and marketing (and arguably, this being an indie project, there weren’t a large budget allocate to these), none had an impact comparable to the Kickstarter campaign. As I mentioned before, the website at the time wasn’t very well done and we drove all the traffic towards the Facebook page, so this is the best way to measure the campaign impact comparative to other things that were done. Because the time period covered is much longer, I opted for a different graph format. You can still see the impact the Pax Trailer had, but it all pales compared to the launch of the game. I don’t have much to add here, if only to say that the release of the second game seemed to have a much stronger impact on acquiring fans than the launch of the first game. I suspect that the commitment of the studio to create more content is what created this effect, but I have no evidence of this. 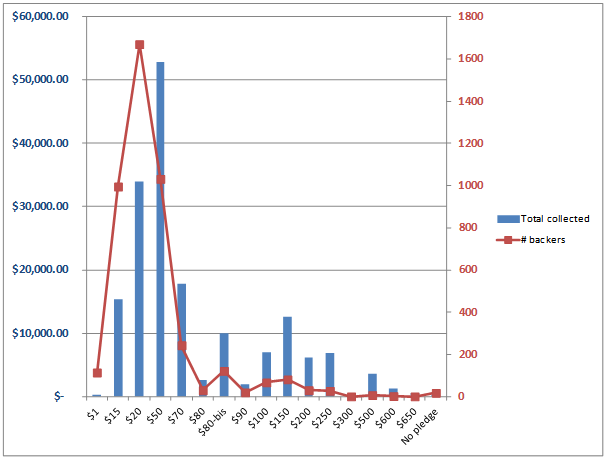 The Facebook promotion that was running at the same time had a role to play as well, but looking at the numbers very closely, it was marginal compared to the release of Strike Suit Infinity itself. Ideally, I would conclude with sales numbers and compare them with the numbers from the campaign to draw even better conclusion, but as said in introduction, we can’t. What I can say is that thanks to the Kick Starter campaign, the studio is still around and that, in the end, the backers, so critical in getting the game finished and released, ultimately represent a relatively small proportion of people who are now enjoying the game.